Ready, set, grow! 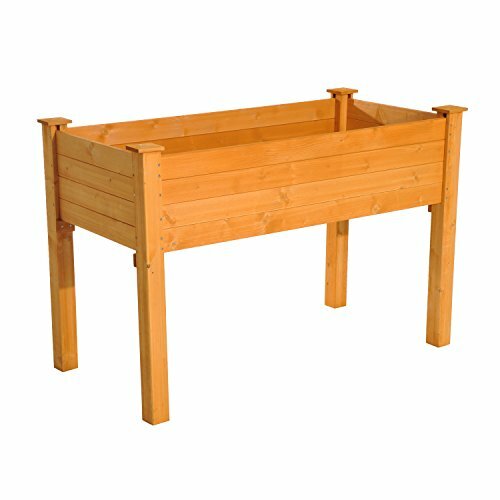 With our Outsunny Elevated Garden 2' x 4' Wooden Flower Bed Planter Box you'll never again have to bend over or stoop down to tend to your garden plants. It's gardening without all the backbreaking work. ✔ ROOM TO GROW: Our 4' long by 2' wide raised planter box provides ample growing space in its sturdy wooden rectangular design with solid supporting frame. ✔ COMFORTABLE HEIGHT: At 2.5' tall it's designed to allow for gardening at a comfortable height. You'll never again have to bend over or stoop down to tend to your flowers, plants and vegetables. ✔ QUALITY BUILT: Crafted naturally from chemical-free and insect-resistant fir wood making it perfect for healthy, organic gardening. 3 bottom openings help to provide essential drainage. ✔ COMPACT DESIGN: Lightweight for easy transport and placement. It fits into smaller areas, allowing you to garden in places such as patios, decks, condos, apartments and more. ✔ THE BETTER WAY TO GROW: Planter boxes are the better way to grow plants, herbs, and vegetables at home. They help to keep weeds away from your soil, prevent soil compaction, provide good drainage and act as a defense against pests.